Programs from 14 schools — including Madras Elementary — representing 13 cities and 11 counties across Oregon and Southwest Washington, are receiving a much-deserved infusion of funds from the Trail Blazers Foundation and Wells Fargo. Through the fifth annual "Take It to the Court for Education" program, $100,000 in direct support will benefit hundreds of students from historically-underserved communities in rural and urban areas. Teachers, school staff, administrators, parents and community members submitted hundreds of grant applications from 73 cities and 28 counties from around the region. 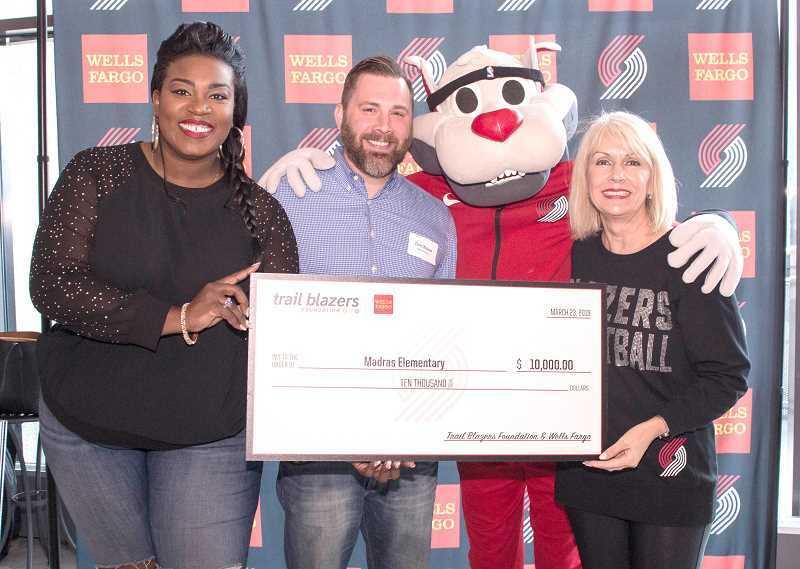 "The Trail Blazers Foundation and Wells Fargo team up annually with a singular purpose in mind — provide much-needed support directly into the hands of schools and programs addressing key issues," said Trail Blazers and Rose Quarter President and CEO Chris McGowan. "The feedback we get from schools around the state tells us that we're providing a financial boost that's making a difference where it counts." "Wells Fargo is proud to team up with the Trail Blazers to support schools across Oregon and Southwest Washington as they prepare our youth to be successful adults," said Wells Fargo Northern Oregon Region Bank President Tracy Curtis. "When students and communities prosper, we all benefit." The 14 grants range from $2,000 to $10,000. Madras Elementary School received $10,000 for the installation of a new, outdoor basketball court with eight hoops. Over the past five years, the Trail Blazers Foundation and Wells Fargo have presented $495,000 in grants to 88 schools in the region through the "Take It to the Court for Education" program.